Synopsis, Our Opinion: “Not Bad” and just an OK value. Producer/Winery: Beneduce Vineyards; Pittstown, New Jersey. 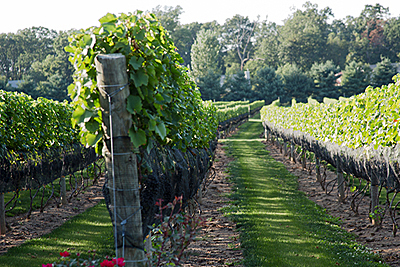 Geographic Appellation: Hunterdon, County, Northern New Jersey. Purchased From: Beneduce Vineyards Tasting Room, Pittstown, New Jersey. Opened 30-minutes before drinking. Clear, garnet/purple color with a lighter rim. Strong ripe fruity aroma. Big and bold full body that was on the sweet side; ripe blackberry taste that turned to strong tar in the finish and was loaded with very chewy tannins and a long tart, tar flavored aftertaste. Dark chocolate cleaned up both the tar flavor and the sweet taste. At $23 it’s getting into some pretty stiff competition and although it was “not bad” and very drinkable, it’s not a great value. We had a local North Carolina Syrah that was under $20 the night before and it was way batter than this wine. If we were blind tasting this we both would have said it was a big bold California Syrah. It was “Not Bad” and just an OK value, at best…and a little disappointing. Having a bottle like this every now and than is a good thing though…it really makes you appreciate Rhone Syrah!!! With all that said we have had Beneduce Vineyards wines we really liked, see: Beneduce Vineyards Blue 2 Blaufrankisch 2013 and a Visit to Beneduce Vineyards Pittstown, New Jersey. 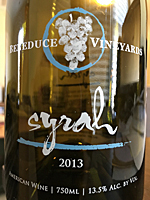 Because of the limited availability of their wines they would not give us a taste of this Syrah and several others, but said this was one of their best..so we came home with a bottle based on their recommendation. We would say skip this one unless your into California reds and go for the Blue 2 Blaufrankisch!!! Comments: Learn more about Beneduce Vineyards and their wines.